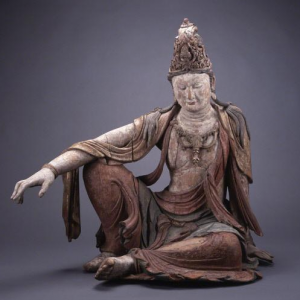 Seated Bodhisattva Avalokiteśvara (Guanyin), China, 11th century. For the past few days I have been reflecting on the Second Mindfulness Training, True Happiness. I have also been painfully aware of the political climate surrounding the mid-term elections. In addition, I’ve been reading White Rage: The Unspoken Truth of Our Racial Divide, by Carol Anderson. The book details the legal and political strategies that have been used since the Civil War to reserve preferential treatment to whites and heap cumulative disadvantages on African Americans, in employment, education, voting, legal rights, public safety, housing, health care, and in other areas. Reading White Rage helped me understand that the racism, xenophobia, demonization, meanness, and deceit that is currently being widely expressed has deep roots in American history and political culture. Thich Nhat Hanh, when he reformulated the Buddha’s precept on not stealing, expanded it to include the indirect harm that may be done to others and our planet by our thinking, speaking, and acting. He called the second mindfulness training “True Happiness,” because only when we are awake, informed, and compassionate, can we be truly happy. How then do we live as committed mindfulness practitioners, wanting to relieve suffering and nourish true happiness? It is a question many of us are grappling with. Two stories come to mind. We must be aware of the real problems of the world. Then, with mindfulness, we will know what to do and what not to do to be of help. If we maintain awareness of our breathing and continue to practice smiling, even in difficult situations, many people, animals, and plants will benefit from our way of doing things. Are you massaging our Mother Earth every time your foot touches her? Are you planting seeds of joy and peace? I try to do exactly that with every step, and I know that our Mother Earth is most appreciative. Peace is every step. Shall we continue our journey? “Again,” he said, “patience is most important. But if you are certain that there is no other alternative, if you are clear and certain about this, then what you must do is this: First, you must think lovingly and with compassion about the policeman. If you think or call him a pig, then you must let him shoot you! But if you can wish him well, and pray for his future happy rebirth, then of course, you stop him from harming the others. You stop him by any means necessary.” We were relieved and amazed. This Thursday evening after our meditation period, we will recite together the Five Mindfulness Trainings and focus our Dharma sharing on the Second Training, True Happiness. Does the training help you to gain clarity? Challenge you? Inspire you to action? You are invited to be with us, in person or in spirit.